Celebrating our 46th season of providing musical opportunities and enjoyment to the community! The Chamber Music Society of Oregon is a 501(c)(3) non-profit organization that is devoted to promoting musical opportunities for persons of all ages. 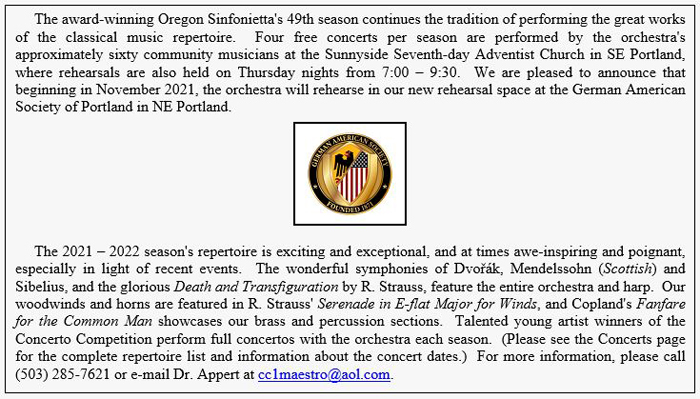 Our flagship performing ensemble, the Oregon Sinfonietta, is a full symphony orchestra of community musicians, conducted by Dr. Donald L. Appert, which presents a series of four free concerts each season. 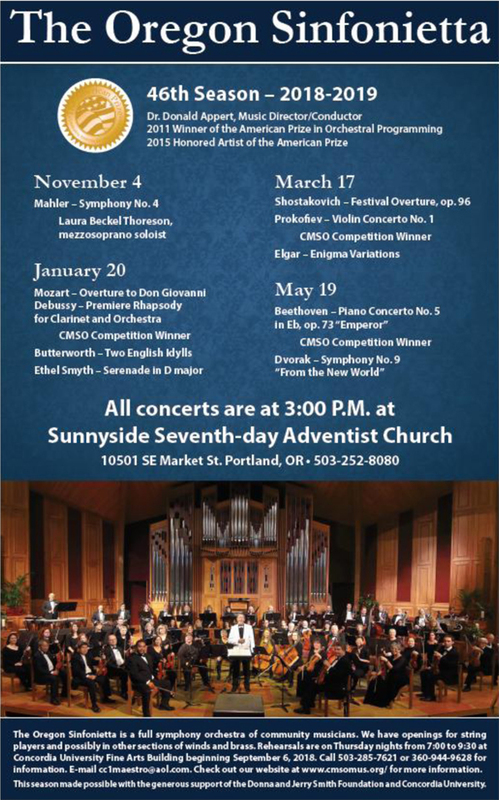 For the past 46 years the Oregon Sinfonietta has consistently offered a superb selection of the classical music repertoire, as well as presenting outstanding young musicians, winners of the yearly CMSO Concerto Competition in performances of full concertos, and performances by world-class professional soloists. We are pleased to announce the 2018 – 2019 season of the Oregon Sinfonietta. We hope you will join us for these exciting concerts as we celebrate 46 years of providing free musical opportunities and enjoyment to the community. (Details can be found on the Concerts page, along with details of the 2019 – 2020 season.) Our collaboration in March 2016 with world-renowned violist Brett Deubner for the première of Dr. Appert's Concerto for Viola and Orchestra was one of the many highlights of that season. The 2018 – 2019 season is sure to have many more memorable moments and highlights! To see a video recording of Mr. Deubner performing Dr. Appert's viola concerto, please go to the Videos/Recordings page. New to the Videos/Recordings page is an audio recording of the Oregon Sinfonietta's January 20, 2019 concert. The Videos/Recordings page also includes videos/recordings of past Oregon Sinfonietta concerts, as well as the orchestra's performance of Vaughan Williams' Fantasia on a Theme by Thomas Tallis, for which the orchestra placed as a Semi-Finalist in the 2016 The American Prize competition for Orchestral Performance – Community Orchestra Division.